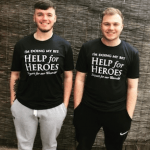 Kris Putman, Joe Potts and Harry Henderson (son of our very own Director Paul Henderson) will be commencing a walk on 31st May in aid of Help for Heroes. The trip has been meticulously planned by Team leader, and former long distance cyclist, Kris who really wants to succeed with this challenge. As you’d probably expect therefore, this is no ordinary walk! They plan to walk from Geneva in Switzerland to Paphos in Cyprus. This is quite a feat as their journey will take them over 2000 miles of mountainous terrain, forests, cities and deserts. They’ll cross 11 different countries to get to their destination; Switzerland, France, Italy, Slovenia, Croatia, Bosnia, Montenegro, Albania, Macedonia, Greece, and Turkey before they finish, no doubt worn out, in Cyprus. There will be a number of other fundraising events happening in association with this. This includes a head shaving sponsorship happening tomorrow at the Henderson’s local pub – The Coronation (where they’ll also be watching the football, if you’d like to join them). 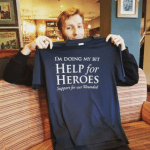 We wish them well, support Help for Heroes and we will keep you updated on their progress. Keep your eyes open for our updates! Joe Potts and, our very own, Harry Henderson.